Which identities are viewed as sacred in our own cultures today?” Which identities cut to the core of us…to the point that a perceived threat produces deep wellsprings of anger, resentment, and hatred? For example, if we substituted the word “America” for “Israel” in Luke 4:25 and 4:27, how would most local USA congregations react? What about the American presidential candidates who purport to love Jesus? One of the things this Gospel today should remind us of is “outsiders” in our lives and in our country are many times God’s insiders. A second point to consider from the Gospel today is the Word of God does not always produce warm and comfy feelings. In fact it often does and should do just the opposite. This makes me wonder as I reflect on today’s reading, do I hear the Word of God as always comforting or do I sometimes find it extremely upsetting? When we think we have things all nicely figured out, we probably don’t. If I am completely at ease, dare I say complacently proud, in my own version of Christianity, then I’m probably worshipping a false idol of my own making. Many Baptized Christians think that if they do not commit mortal sins, if they're not harming others, then everything is fine in their relationship with God. In other words, if the fig tree is not harming all of the other trees, then everything is okay. Jesus says clearly that those people are mistaken. Likewise are mistaken those who subscribe to a certain minimalism in the faith, that if they basically try to keep most of the commandments, if they show up to Mass, say a few prayers each day, light a candle or two, put some change in the collection basket, the Lord will be satisfied or perhaps even give them a medal. Jesus says otherwise. The owner of the vineyard is looking for trees that bear fruit! "What is the fruit God wants?" "How do I bear that fruit?" The fruit God wants consists of acts of self-giving love done for others. This is what Jesus describes in the Sermon on the Mount, " Let your light [the reflection of Christ's light] shine before others, so that they may see your good works and give glory to your Father in heaven" (Mt 5:16). We do this by "loving God with all our heart, mind, soul and strength"(Mk 12:30) and "loving others as Jesus has loved us" (Jn 15:12). This love is more than a wish or good will toward another, but a work, a concrete act of love. There are fruits that we need to come from our spiritual life, that flow from our relationship of love with God. There are also fruits called the spiritual and the corporal works of mercy that we're called to do out of love for God and others, like passing on the faith to children and colleagues, going the extra mile to care for those who need it. Jesus said clearly that when he comes at the end of time to judge the living and the dead, he will separate the dead into two groups like a shepherd separates sheep from goats. To those on his right, to those who are saved, he will say, "Come you who are blessed by my Father. Inherit the kingdom prepared for you since the beginning of the world, for I was hungry and you fed me, thirsty, ... naked, ... ill, ... a stranger, ... in prison ... and you cared for me" (Mt 25:31ff). Then he will say to those on his left, "Depart from me, you accursed, into the everlasting fire prepared for the devil and his angels, for I was hungry, ... thirsty, ... naked, ... ill, ... a stranger, ... in prison ... and you did nothing for me." Jesus didn't give us an exhaustive list of actions, but he did tell us that what we did or failed to do for the least of his brethren, we did or failed to do to him. And on those fruits, or lack thereof, we will be judged. When sin becomes bitter, then Christ becomes sweet. Far away hills look green, there are many attractions in life, there are many voices saying to us, “Follow me” or, “Follow your desires and you will find happiness.” But the best offer of happiness is from God our Father, “All I have is yours.” God our heavenly Father is outside the door waiting for us to come to him. When we return he runs to us, clasps us in his arms and invites us into the party. For the remainder of Lent we might try to make an effort to answer that invitation from our heavenly Father, “all I have is yours.” During every Mass we receive the same invitation from Jesus, “This is my Body which will be given up for you...this is the cup of my blood, it will be shed for you.” Let us go into the house and enjoy God’s party. Saint Thomas More said that no heresy is all falsehood. In a similar way, there is no sin that does not have either a good object as its goal, or an intention that is believed to be good. Of course, subjectively believing an intention to be good does not make it objectively good. Every one of our sins is an offense against Jesus Christ, the Father’s only-begotten, who called Himself “the Way, the Truth, and the Life” (John 14:6). We imagine that our sins will bring us a greater, longer or more satisfying life. Yet Jesus teaches us that we can only acquire His inheritance of divine Life from the Cross. Is this parable credible today in our contemporary situations locally and globally? Can we recognize real situations in the imagined one? Most certainly we can recognize it at the international level, where the poor ─persons and countries─ are starving and all too many of them confined in refugee camps, while the rich and powerful pay only as much attention to it as it serves their political or financial interest. Pope Francis has convincingly called attention to this inequality in his encyclical Laudato Si’, but prophetic voices find it hard to penetrate the bastions of those on the affluent side of the inequality, perhaps a case of social “affluenza”(see P.S. below). Institutional global approaches continue to fail the poor, because both physically and socially they have no voice that can be listened to. So yes, Jesus’ parable is credible today at the international level. But we can also recognize the parable at the national and local level. Our country is number two in the world in social inequality. Locally we need only to go to any of the various homeless shelters to see what is actually only the tip of the iceberg. Large sectors of our population live at or below the poverty level and they are in many ways ignored, while the rich and powerful ─“the beautiful people” ─ are glamorized. Jesus’ parable is surely credible today at our national and local level. So Jesus presents us with a faith critique of our reality. Both Lazarus and the rich man die, for wealth has no say there. And now, deprived of the affirmation of peers and cronies, the rich man begins to see the light. The scene is reminiscent of despotic Sadam Hussein asking for leniency at his trial. 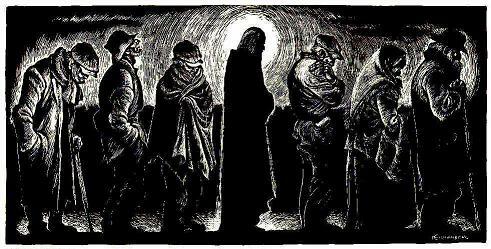 We may have thought that perhaps in his loftiness the rich man was not even aware of the presence of that poor man at his door or at his estate’s gate, but he does recognize the beggar and he even knows his name: Lazarus. It was not a matter of his not being aware of the beggar’s presence and needs. P.S. for readers outside the U.S.A. “affluenza” was the excuse presented for leniency in sentencing by a rich young man, who driving drunk had killed four people. He claimed that in his affluent environment he had not been taught to face the consequences of his actions.